Are you ready for Memorial Day Weekend parties? Are you supposed to bring a dish to pass? Well, check your spice cabinet and run to the store for potatoes, onions, celery, and mayo. And get ready to share this fast, easy, and delicious recipe, because your friends will ask you for it. I asked my dear husband Joe’s mom for it myself after our last family cookout and we have made it several times since. 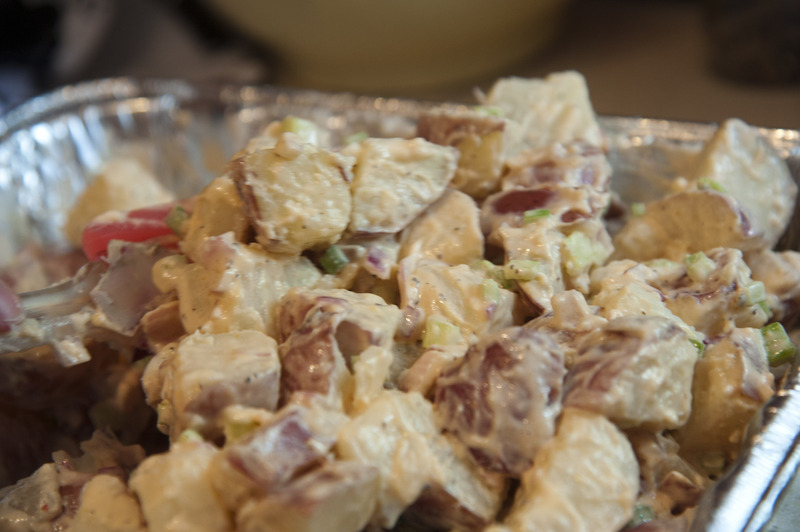 The secret to great potato salad is more, more, more flavor… because potatoes can be boring. For this recipe–which my sister and I made as a side for the Midnight Ribs Cook-off in Cincinnati (more on that soon)–we doubled down on mom’s spices and featured red onion and lots of celery for crunch. It’s important to get the dressing on the potatoes while they are still warm (but not hot) so it will soak right in. These are even better the next day, and my sister and I discussed possible enhancements (listed below) as we Monday (well, technically, Friday) morning quarterbacked over the very minimal leftovers. Enjoy! Cut the washed, unpeeled potatoes into bite-sized chunks. Boil the potatoes in well salted water until tender, about 15 minutes from a cold start. Drain. While the potatoes are cooking, dice the red onions and celery, then make the dressing. Mix all dressing ingredients together with a whisk. In a large bowl combine the celery, onions, and dressing along with the (still warm) cooked potatoes. Add salt and pepper to taste. Chill until ready to serve.